DropBox is one of those programs that I came across by chance and boy am I glad I decided to give it a try! Dropbox is a program that offers online and cross platform file syncing between your connected devices. One of the great features about it is that you don't really have to do anything to sync your files. Dropbox will automatically detect changes to any of the files that are placed in its folder and will update the files on the other devices. When it comes to syncing Dropbox allows you to sync any file regardless of its size or file type. Don't think this program is picky about how it syncs either as it can sync your files from your PC to your Mac, from your Mac to your Linux machine, from your Linux to your Windows machine. I use this program to sync to my laptop, desktop and iPod. Online backup is available as well. A free account gets 2GB of storage while paying customers may get up to 100GB available for backup. 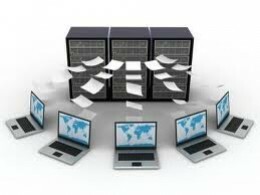 Since your files are stored on a Dropbox secured sever you can access your files from any computer that has internet access available. They offer a downloadable program and a web administration program to access your files. Your files are transfered and secured on their servers using military grade encryption to the Dropbox website. My best guess is 256bit encryption. Online collaboration is another neat feature of this program. You can share the same file with several different people who all can work on it at the same time. This works out great for business or school projects when not everyone can be in the same place at the same time. Changes and edits to the file are made instantly available so you don't have to email or send files back and forth. You are given the ability to who has access to your shared folders. If you don't like what someone is doing you can kick that person out and remove shared files from their computers at the same time. Like to stay in touch with your family or friends through the use of photos? How about creating an instant online photo gallery with just regular folders. You can control who has access to them and who gets to see them. I live in another state than the rest of my family but we all can share photos through the use of an online shared gallery. All they have to do is upload the photos and Dropbox syncs the files between all my systems and I'm good to go! Now some of you may need more than 2GB of free space they offer. You can either purchase this or use the Dropbox affiliate program which gives you extra space for every person who signs up under your account. I personally use this program for syncing backups of my college homework and articles I have written. Sometimes I want to write my laptop and other times I'll be at my desktop. I have even done editing on my iPod. A free program that cross platforms file syncing regardless of size or type automatically. Free 2GB of online storage space with the option to increase it. The ability to access your files anywhere an internet connection exists. Peace of mind knowing your files are encrypted and stored on a secured sever. The ability to collaborate on files and projects with instant updates. A free iPhone and iPod application.